Need more information about booking Home 7307859 ? 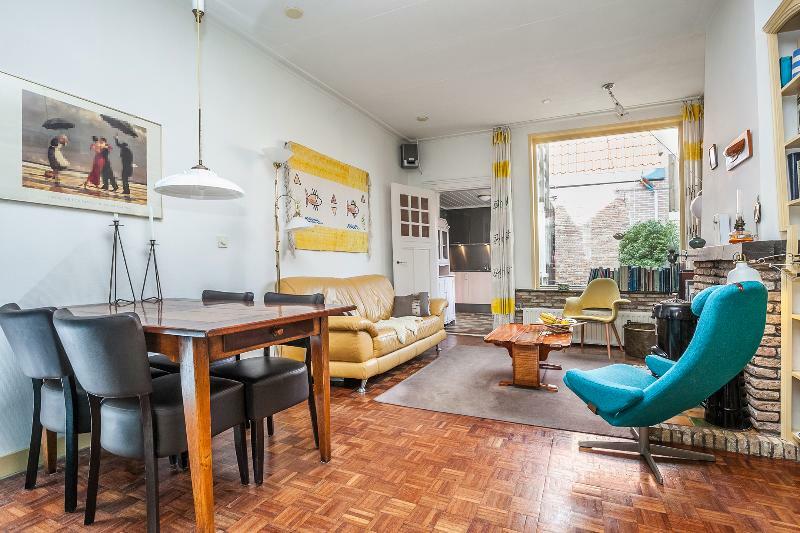 Quietly situated along the most beautiful canal of Enkhuizen, minutes from train station, town center and museums. Own house, so all comfort, for 2 to 4 people. Recently renovated. Feel at home in the nautical atmosphere of this historic little building. The Water and Fire House was built in the first half of the 17th century. Later extended, faceade renovated, but this narrow canal house still breathes originality. The well in the courtyard recalls the time that rainwater was stored in the basement, to be resold heated. In the winter I use the house and I am teach Navigation at the Enkhuizen Nautical College. In the summer I sail and you can rent my house with up to 4 people. Helmi is my support, and your host and source of information. The entire house is available for guests. Downstairs a cozy living room, with dining table and working area with desk. The adjoining kitchen opens onto the courtyard. This is ideal for safely storing bicycles, thanks to a private rear entrance. The upper floor was recently renovated and has two bedrooms, a bathroom with shower and bathtub and a closet with washing machine. Helmi will welcome you and give you the key. Upon request Helmi can also provide breakfast, guide you and answer all sorts of questions about our beautiful town. The South Havendijk is one of the most picturesque and characteristic parts of Enkhuizen. The Zuiderzee Museum and the ports are just around the corner, the carillons of Drommedaris and Zuiderkerk play their pleasant melodies, and around the corner is the first of many cafes and restaurants that the city has to offer. NS train station 5 minutes walk away. Amsterdam city center is less than 1 hour. Bike rental at the end of the canal. Free long-term parking at the train station. The easiest is to unload luggage in front of the house and then park your car at the station (5 minutes walking distance). Taxis to book by phone. You can get in touch with Eef (the owner) through the contact form on this page. Send Eef (the owner) an email through the contact form on this page. Alternatively, if there’s a phone number on this page, you can call them. How do I contact Eef (the owner)? If you’ve already booked, go to Manage your holiday booking to view Eef the owner's contact details or send them a message. Or send Eef (the owner) an enquiry through the Contact the owner/manager form if you’d like a quote or more info first. When you pay online through the Book your stay form, a booking request is sent to Eef (the owner). You’ll find out within 24 hours whether they’ve accepted - no money will leave your account before then. You can also request a quote from Eef (the owner) through the contact form. The owner will email you the total cost for your dates and a link to book and pay online. Use the Book your stay form to pay provisionally online. You can pay by credit/debit card or PayPal. Eef (the owner) will have 24 hours to accept the booking and no money will leave your account before then. Why can't I call Eef (the owner) before booking? You’ll need to contact Eef (the owner) to do this. Send them a message in Manage your holiday booking or through the contact form on this page. You can request to change the dates or number of people on your booking via the Manage your holiday booking page. To change your holiday dates use the Edit booking button. If you need to change the number of guests staying then send Eef (the owner) a message. If Eef (the owner) agrees, they’ll send you a revised quote outlining the changes. You can review and accept/decline this from the Manage your holiday booking page. You’ll have 48 hours to take action before the revised quote expires.